the scent of green bananas: out of the pink and into the blue. Posted by santos. This entry was posted on 20051026 at 1:39 AM You can skip to the end and leave a response. Hi Santos, you are very welcome! Great photo, by the way. Makes me want to eat them right off the page. ive been awake since two finishing up a report for work. i would love to have a batch at my desk with some strong coffee... and a little sleep time. alas, one hour to go and ill be done. 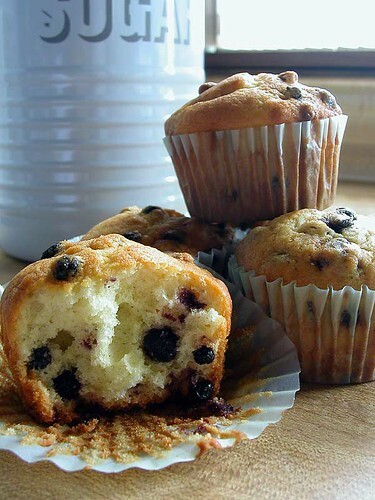 shall try making these soon - home made blueberry muffins are always much nicer than store bought. hi elise--it's a great recipe, i'll definitely use it again. argh! you have that cute retro sugar bin. i have been admiring the tea canister (and the laundry detergent tub and the...) in all their lovely shades. hi bowb! ooh, how many colours? we can only get blue and cream here. That's a great photo, Santos. And I'm laughing from the smoking salmon comment! hey OF, and nic, too--tell me, tell me true--what's the difference between a cupcake and a muffin? found a recipe for homemade litmus paper involving cabbage... challenge: to make an acid/alkali-sensitive cupcake!!! Aaaah Santos, let me put my thinking cap on: Cup cakes = mini cakes (and if I have my ways they're all pink topped or with blueberries). And usually sweet. I have never had any savoury cupcakes, has anyone?? Muffins are not iced and it can be savoury and more dense in texture. We have plenty of muffins here in Norway at the cafes, but strangely enough I haven't seem much cupcakes. You know why? Because nobody here can tell the difference either ;). So there you go, back to square one. (Lisa's putting her thinking cap back in the fridge). bramble, what a craaazystupid idea. i HAVE to do it! dunno, lisa, sounded like a good enough explanation to me.